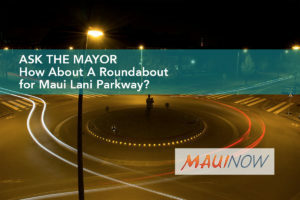 Q: I travel Maui Lani Parkway often to get to Wailuku and Waikapū. 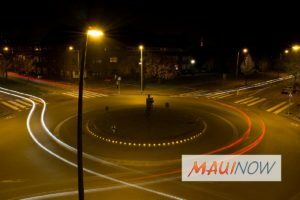 No matter what time I travel, once I get to the four-way stop at Maui Lani and Kamehameha Avenue, it takes a long time to reach the stop because traffic backs up and it takes a good while to continue traveling. Are there plans for a roundabout at that intersection? If not, why? A: My administration put in $2.8 million in our proposed Fiscal Year 2019 budget to the Maui County Council for a roundabout. Our engineers conducted a feasibility study of a roundabout at the subject intersection and determined that there is enough right of way to accommodate a roundabout and that it will allow all modes of traffic to go through the intersection more efficiently than a traffic signal. Nationwide studies also show that roundabouts have a reduced number of conflict points for vehicles, pedestrians and bicyclists, as opposed to a traffic signal, and cost less to maintain in the long-term. The Maui County Council’s Infrastructure and Environmental Management Committee is scheduled to further review the project later this year. The committee is expected to render a referral to the council’s Budget and Finance Committee to either release funding for the construction of the roundabout or a traffic signal. Submit your own questions about County of Maui programs, services, operations or policies to Mayor Alan Arakawa at AskTheMayor@mauicounty.gov , (808) 270-7855 or mail them to 200 S. High St., 9th Floor, Wailuku, HI 96793.